Do not forget your passports for the Alhambra Tour. You can visit the whole monumental site: Alcazaba or the fortress, Nasrid Palaces, Partal gardens, Medina, Generalife Palace and her gardens. Do not forget to respect the time printed on your tickets for the Nasrid Palaces. If you are late you will miss this wonderful part. You can visit the whole monumental site except for the Nasrid Palaces. (Nasrid Palaces are not included in this type of ticket). However, you will see the Alcazaba or fortress, Partal Gardens, Medina, Generalife Palace and her gardens. Visit of the Nasrid Palaces at night. The visit includes all the elements of the Palace as the Palace of Justice or Mexuar, Palace of Comares, Lion Courtyard and the christian chambers added by the Holy Roman Emperor Charles. We recommend this ticket especially for high summer. 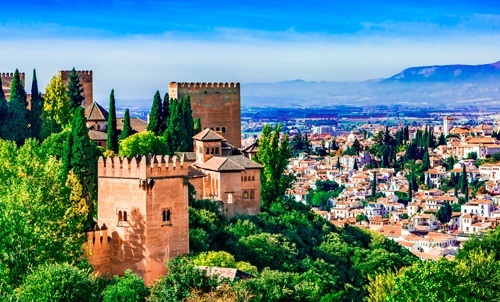 A combined tickets including Alhambra General ticket and monuments of the old Moorish Quatre the Albacin like The 14th century Palace of Daralhorra, The Moorish houses of Zafra and Horno del Oro, The 11th century Hamam, and finally the caravansaray Corral del Carbón. This ticket is perfect if you have more time to spend in Granada. Combined General Alhambra ticket including Carmen de Rodriguez Acosta that is a typical house with garden and museum of Granada of a famous painter and colector of the city. * If you buy a ticket with any discount you have to show documentation at the main ticket office to get a valid ticket before entering the monument. * If you buy a ticket with any discount you have to show documentation at the main ticket office to get a valid ticket before entering the monument. Do not forget to make a reservation for the children under 12 years old. Do not forget to present your documentacion in the ticket office if you have any special discounts. Do not forget your passports. *** These rates are the official Alhambra ticket prices. Travel agencies organize a package tour with several services and final price can be more expensive. Prices updated in January 2019.